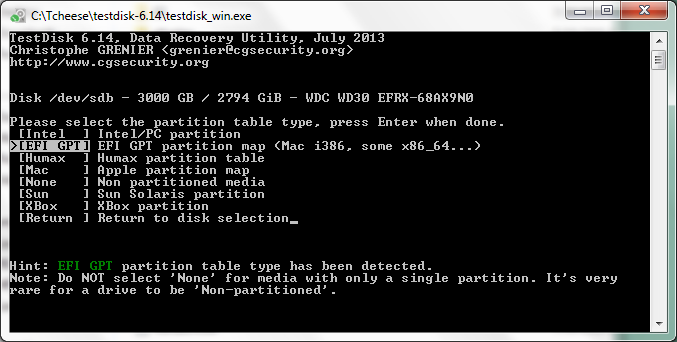 I'm facing a situation where i would like help to recover my partition table. 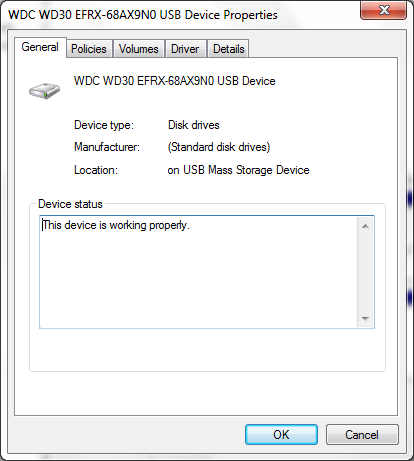 The drive is not formatted, do you want to format it now? and symptoms are same as described here - http://www.cgsecurity.org/wiki/Advanced ... MFT_Repair. I've run testdisk and the screenshots are as below. The Analyze/Quick Search was at 39% at the end of 4 days before a power outage took out my dockstation. I dont have a PC right now and hence using the dockstation via USB to run testdisk from my laptop (configuration - Win 7 64-bit). I'm using the 32-bit testdisk version (http://www.cgsecurity.org/testdisk-6.14.win.zip) but i dont have the latest testdisk.log file since I re-ran it as Intel/PC Parition. Since it being detected as a EFI-GPT disk type, there is not much guidance or documentation available on cgsecurity and the Analyze/Quick Search is taking an awful long time. Please advise how should i be proceeding here. Any help will be truly appreciated as there is nearly 2 TB of data on my drive. Thank you! In your disk management console, your disk is displayed as basic. Basic means, it's an Intel-MBR. 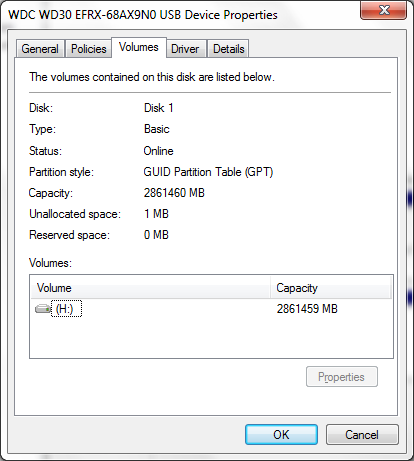 Intel MBR only supports partitions up to 2.2 TB. 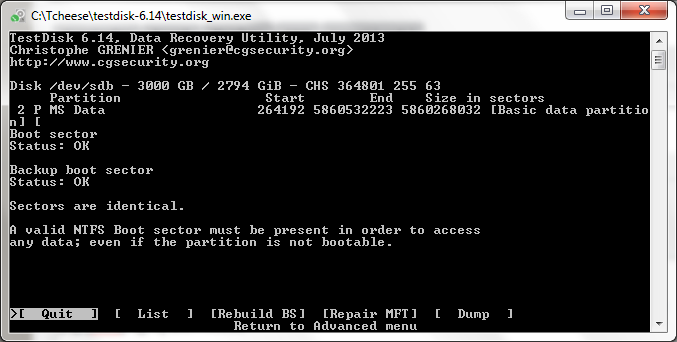 For larger partitions you need GPT (testdisk EFI-GPT). If you use a partition bigger than 2.2 TB and Intel-MBR and you'll write beyond the limit if 2.2 TB, you'll risk loss of data. Before you start to make a boot sector diagnose, would it be possible to right click in your disk management console and the left small square called disk 1? 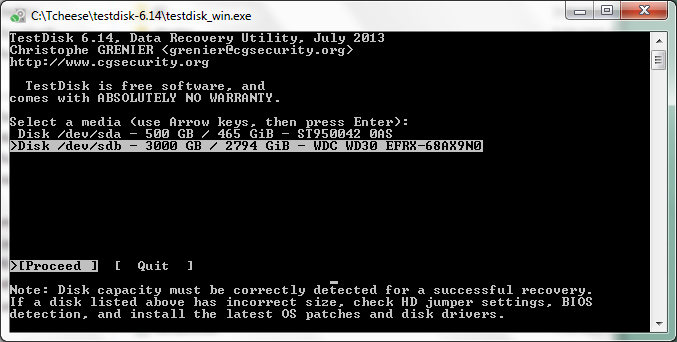 Windows often reports GPT disks wrong. If there is a description like convert it to basic, indicates that you have a GPT-disk. If there would be a description like convert it do GPT, then you know that your disk is basic. Before you diagnose your disk as GPT, it must be a GPT-disk. Before you go to change anything to you disk, you should create a backup of your current situation. Please confirm in TestDisk at Analyse and navigate to Backup and press Enter. 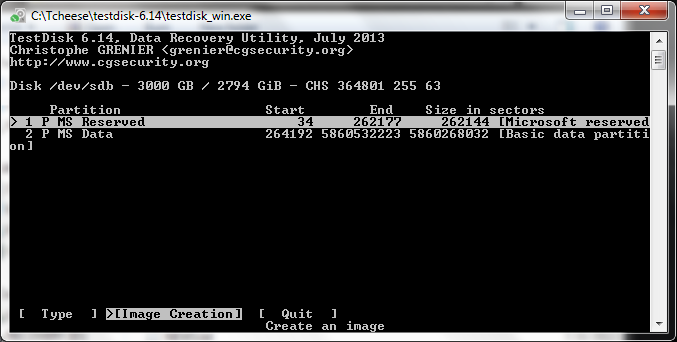 This will save a small txt-file in your testdisk folder containing infos about your current situation. You can restore your situation confirming at Quick Search and pressing L for load! Please upload a screen from your disk management console and info through right clicking into the left smale square. Please don't format your disk, because it will override your file system. Hello Fiona, thanks for your response. I've taken backup at Analyze and backup.log was created. There is only Type, Image Creation and Quit listed. Is it important that i connect this drive directly to the PC motherboard? Right now, on my laptop it is detected as a USB-SATA Bridge connection with the dockstation. Look forward to your reply and cheers! Hello, anyone can help? PLease tell me if i need to do something else - like using a PC instead of a laptop etc? I'd rather be willing to donate here than buying some paid software. In the Advanced menu, select the second partition, the one where your data are, if you want further options. Hello Chris, thanks for you response. I tried selecting the second "data" partition but the same options were being listed. 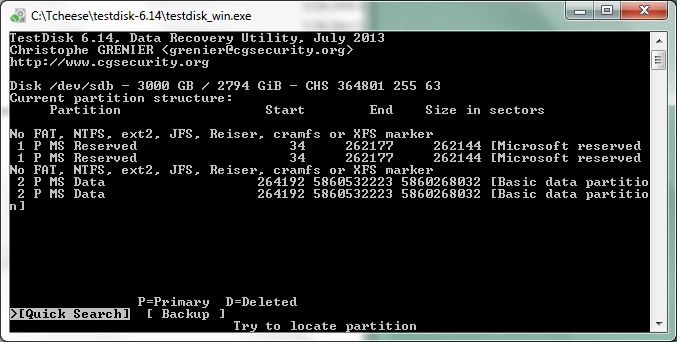 Also, i tried to change the Type to NTFS but there was no NTFS listed for the second partition. When you use T'ype', choose MS Data (actual value), press Enter and next select NTFS. As per your instruction, i selected Type as MS DATA, then Enter to Proceed, then selected NTFS and Proceed. Now, it shows as below. Notice the "Red 3TB" partition name which now appears. Got me excited! List option shows "No file found, filesystem may be damaged." Repair MFT option screenshot is as below. 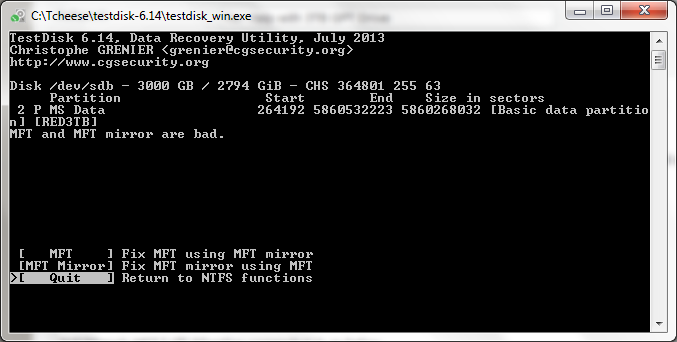 As per the Advanced NTFS Boot and MFT Repair manual, "...If both MFT and MFTMirr are damaged and thus cannot be repaired using TestDisk". Is this the end of road for me? Eagerly await your guidance. If if it doesn't work, you may want to try other data recovery utility, even if you have already tried them, it will be easier for them now as TestDisk has fixed the NTFS boot sector. Begin by running "cmd" (Right-click run as Administrator) and type "chkdsk /f H:"
You can always use PhotoRec to recover your data but it won't recover the original filenames.